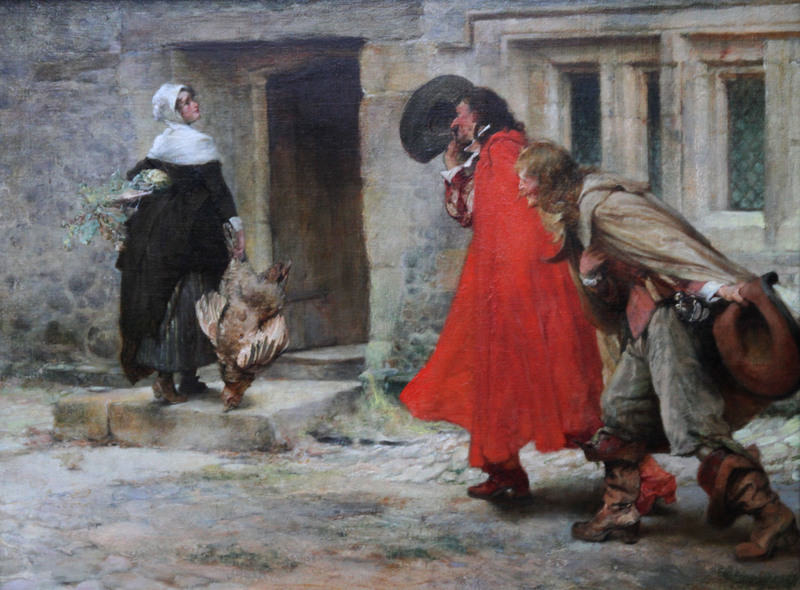 This charming oil painting is by noted British artist Edgar Bundy. The painting was painted in 1903 in a realist palette. Bundy was a prolific exhibitor at the Royal Academy London, exhibiting over 40 works between 1905 and 1922. 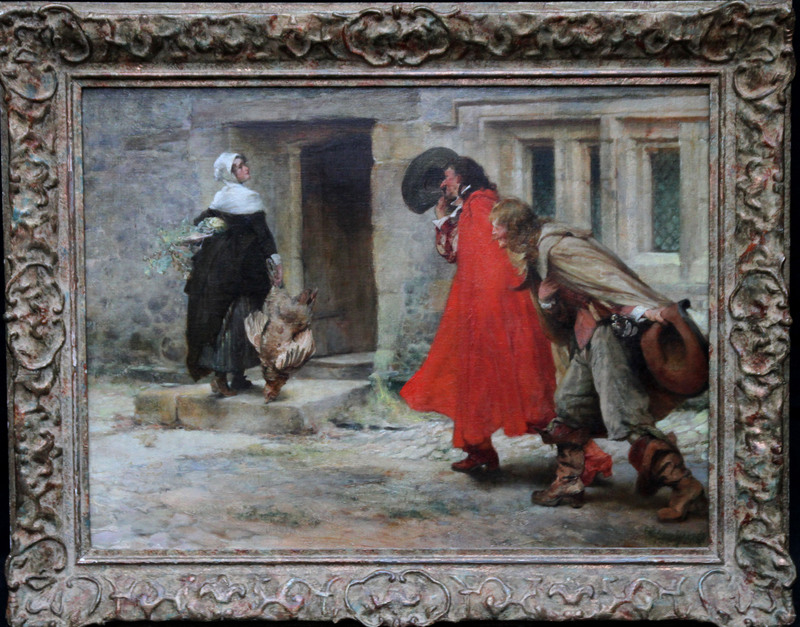 This painting may well have been his 1920 exhibit, but entitled The Rivals. 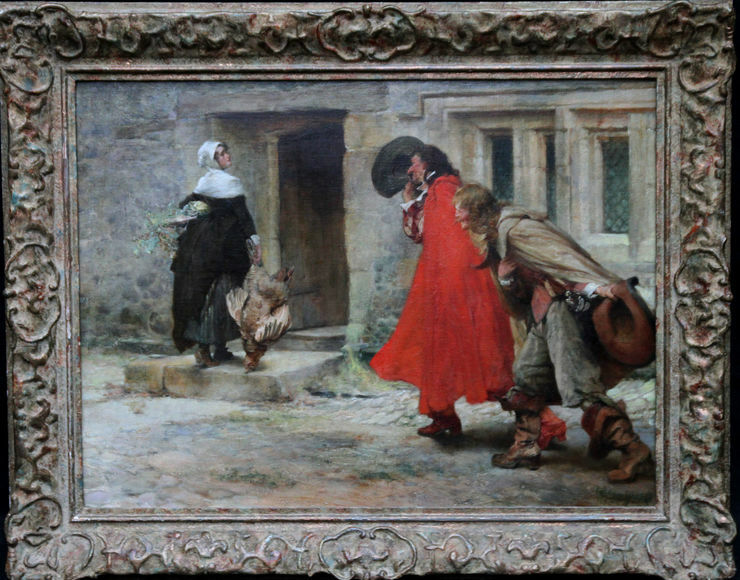 The composition is a flirtatious scene of two cavaliers greeting a pretty kitchen maid as she enters a house with fare from market. One of the cavaliers is wearing a striking red cape and shoes and they are both doffing their hats. A lovely painting.Signed and dated 1903. Also inscribed on label verso. Housed in an ornate frame, 30 inches by 24 inches and in excellent condition. Edgar Bundy ARA (1862-1922) was an English painter. Bundy had no formal training but learned some of his craft at the studio of Alfred Stevens. Bundy specialised in historical paintings in oil and watercolour, usually in a very detailed and narrative style, a genre which was very popular in the Edwardian time Bundy lived in. He exhibited at the Royal Academy in 1915 and at the Paris Salon in 1907. In the Tate Gallery is his Royal Academy painting of 1905 entitled The Morning of Sedgemoor depicting the Duke of Monmouth's rebels resting in a barn before the battle. Influences in Bundy's work include Pre-Raphaelites such as John Millais, William Morris and the works of John Ruskin.